If it is a poll that you are running, you go to edit your original post and scroll down to the poll options and can reset the poll and do whatever you need there. Does that help? Are you the one running the poll..or is it in someone else's poll? 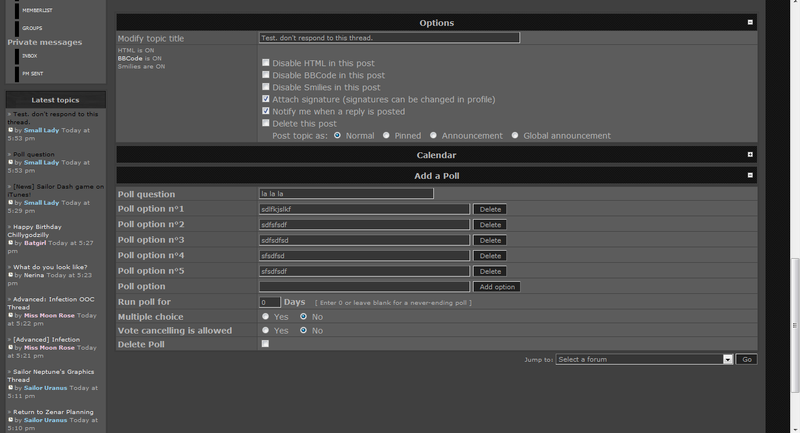 Ok, now I don't remember if I have this option cause i"m an admin BUT i'm assuming since you are the creator of the poll you should be able to see these options. Ah ok, thanks Louise...I'll always thought you could change it on your own (I have been staff on here so long i don't even remember what regular members can see >.>). Those just need to be added or do they replace the current choices? Okie! All done! In the future, you can also PM the moderator of the section (Starchild), she should be able to do that for you.